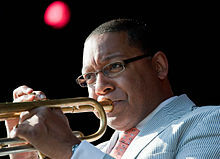 One of the hardest swinging and best-loved of his 1980s recordings wraps listeners in the astonishing group sound that defined Wynton Marsalis. Firey performances by the players jazz writers dubbed “The Young Lions”: saxophonist Branford Marsalis, the “Doctone” – pianist Kenny Kirkland, the “Net Man” – bassist Charnett Moffett, drummer Jeff “Tain” Watts, and of course Wynton himself on trumpet. Copyright© ジャズの名盤 , 2016 All Rights Reserved.